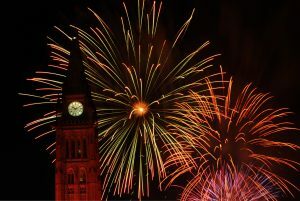 July 1, 2017, is not just Canada’s 150th birthday. 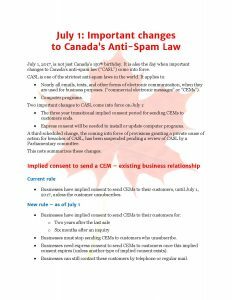 It is also the day when important changes to Canada’s anti-spam law (“CASL”) come into force. Nearly all emails, texts, and other forms of electronic communication, when they are used for business purposes. (“commercial electronic messages” or “CEMs”). The three year transitional implied consent period for sending CEMs to customers ends. Express consent will be needed to install or update computer programs. A third scheduled change, the coming into force of provisions granting a private cause of action for breaches of CASL, has been suspended pending a review of CASL by a Parliamentary committee. Businesses have implied consent to send CEMs to their customers, until July 1, 2017, unless the customer unsubscribes. Businesses must stop sending CEMs to customers who unsubscribe. Businesses need express consent to send CEMs to customers once this implied consent expires (unless another type of implied consent exists). Businesses can still contact these customers by telephone or regular mail. Make sure that systems used to track implied consents recognize this change in the duration of implied consent. Make sure that staff who send CEMs know about these changes. Try to get express consent from customers before implied consents expire (an email asking for consent to send CEMs is itself a CEM). Software providers have implied consent to update or upgrade computer programs that were installed before CASL came into force. Express consent is required to update or upgrade any computer program. The requirements for obtaining consent are somewhat less for updates or upgrades in certain circumstances. Make sure that express consent has been obtained for updates and upgrades before the update or upgrade can be installed. Only the CRTC enforces most of CASL’s provisions. New rule – now suspended! At the last moment, the federal government suspended the coming into force of provisions making a private private right of action available for breaches of CASL’s provisions on CEMs and computer programs, as well as Federal privacy legislation (PIPEDA), and Competition Act provisions dealing with misleading representations in electronic messages (s. 74.011). This delay comes after lobbying from businesses. The government is asking a Parliamentary committee to review these provisions as part of its scheduled review of CASL. Use this delay to ensure your business is compliant with CASL, PIPEDA, and the Competition Act. Review procedures and systems for sending CEMs to ensure they are compliant. Re-educate staff on the importance of complying with CASL, PIPEDA, and the Competition Act. 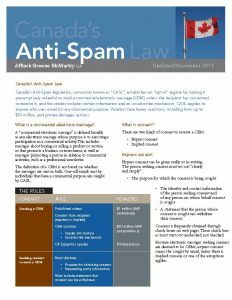 Learn more about CASL: read our whitepaper: Canada’s Anti-Spam Law.